A deadline for the formation of a new Palestinian cabinet passed on Wednesday with Prime Minister Ahmed Qurie and President Yasser Arafat locked in a power struggle threatening to delay peace moves with Israel. Arafat transformed Qurie's eight-member cabinet into a caretaker government on Tuesday hours before its 30-day term expired at midnight, allowing more time to overcome sharp disagreement on division of security powers. The delay threatened to hold up renewed high-level talks proposed by Israeli Prime Minister Ariel Sharon aimed at restarting a stalled, U.S.-backed "road map" to peace. Arafat aide Nabil Abu Rdainah told Reuters the president had asked Qurie "to continue with his work and to consider the current cabinet as a caretaker until a new cabinet is formed." Israeli media reports had said earlier that Sharon and Qurie could meet as early as this weekend, though there is skepticism on both sides about the prospects for significant progress after three years of Israeli-Palestinian bloodshed. Arafat and Qurie are vying for control of security services seen as vital for meeting the road map's requirement for Palestinians to rein in militant attacks on Israel. "When (Palestinian leaders) relate to this issue (of security) with all due concern...they will find us to be a partner for a dialogue on co-existence," Israeli Defense Minister Shaul Mofaz told reporters. 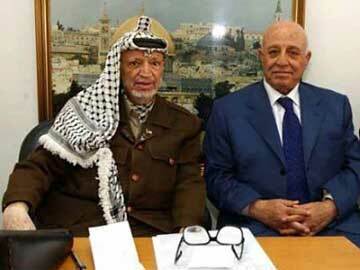 Arafat, the 74-year-old symbol of Palestinian nationalism, opposes Qurie's nomination of General Nasser Yousef as interior minister with control over security forces. Qurie's predecessor, Mahmoud Abbas, resigned in September following a similar dispute with Arafat over security powers. Arafat installed a Qurie-led emergency cabinet on October 6 amid Palestinian concern Israel might carry out its threat to "remove" the president, after a suicide bombing killed 22 people in an Israeli restaurant on October 4. Israel made no move against Arafat, but tightened its military blockades in the West Bank and Gaza Strip and bombed an alleged Palestinian militant base in Syria. Cabinet member Saeb Erekat, who is close to Arafat, predicted the government would act in a caretaker role for two to three days and no more than a week past the deadline. Qurie told reporters the Palestinian parliament would convene next week for a confidence vote in a new government. Hassan Abu Libdeh, director of Qurie's office, said earlier that the prime minister wanted his Interior Ministry to have strong security credentials, as his first order of business will be to persuade militants to halt attacks on Israelis. If Qurie caves in to Arafat, it would likely anger the United States and Israel, which have accused the Palestinian president of fomenting anti-Israel violence -- an allegation he denies -- and have tried to sideline him. By forming a permanent government, Qurie would meet a key demand of the "road map," which calls on the Palestinians to implement reforms and stop militant attacks and demands that Israel stop building in Jewish settlements on occupied land.